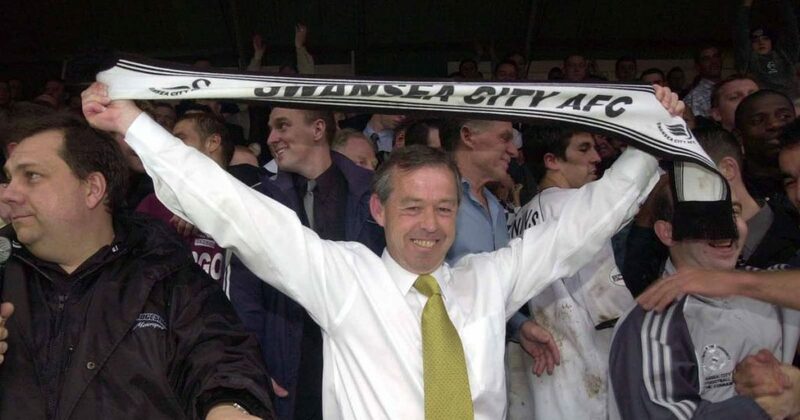 Mention the name Brian Flynn to any Swansea City fan and you’ll probably be told about how he steered the team to Football League safety in May 2003, thanks to a last day victory over Hull City at the Vetch Field. The former Wales International, took over the Swans managerial hot-seat from Nick Cusack in September 2002 and set about rebuilding the side. It was a difficult task, but one which he ultimately succeeded in doing. Of course, Flynn who stands just 5ft 4” tall, mad his name as a player before becoming a manager, having started his career at Burnley before venturing to Leeds United. During the latter stages of his career he played for Wrexham, whom he would also go on to manage. In fact, Flynn made over 565 club appearances during a 21 year playing career. In fact, it was the Wrexham connection that helped Flynn prise Lee Trundle away from the Racecourse to the Vetch Field during the summer of 2003. Older Swansea fans will no doubt remember Flynn as a tenacious midfielder plying his trade in the red shirt of Wales over a 9 year period between 1975 and 1984. Brian Flynn the manager, also unearthed such gems as Ashley Williams and introduced him to the Welsh international setup. Back in December 2017, an official biography, written by Leon Barton called ‘Brian Flynn: Little Wonder’, was released which celebrated the playing and managerial career of a man who is highly regarded in the football fraternity. The good news for Swansea fans is that Flynn is now returning to his home-town of Port Talbot on 4th October for a special evening with guests to celebrate his life in football. You’ll need to be quick though as tickets are going fast, for what will surely be a special night spent reminiscing about Flynn’s career, his time at the Vetch Field and quite possibly an insight into his more recent role of recruitment scout at the club. ‘Brian Flynn: Little Wonder’ by Leon Barton is published by St. David’s Press.